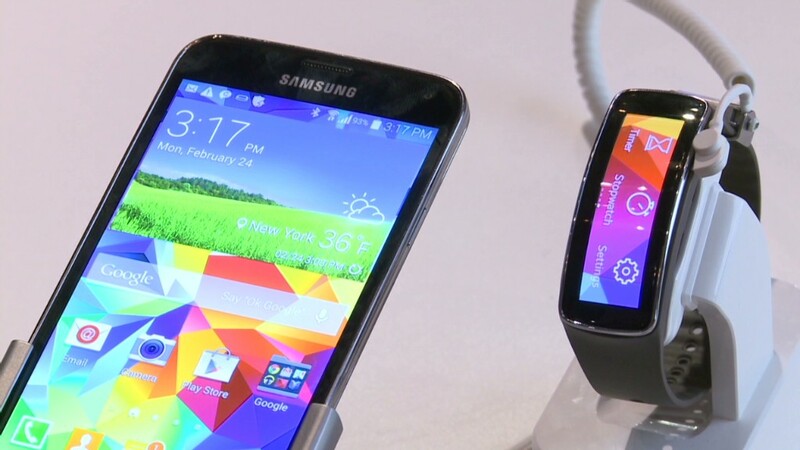 Samsung unveiled the Galaxy S5 smartphone -- an improved, but not radically different, successor to last year's Galaxy S4. Still, Samsung had a few tricks up its sleeve for its top-of-the-line Android phone. Samsung claims that the Galaxy S5 is weatherproof and resistant to water and dust. The phone's display can adapt to extreme bright and dim settings. The Galaxy S5 also has an on-board heart rate sensor and a fingerprint scanner on the home button. Compared to last year's model, the Galaxy S5 has a bigger screen (5.1 inches), a faster processor (2 GHz) and a bigger battery. But none of those represent dramatic improvements. Its screen is 2% bigger, the processor is 5% faster and the battery is 8% larger than on the Galaxy S4. One potentially big improvement is the camera, now with 16 megapixels, up from 13 a year ago. It can capture ultra-high defiition video and has an incredibly fast shutter -- capable of snapping photos in 1/3 of a second. But there are a few tradeoffs. The Galaxy S5 is ever so slightly heavier (a half ounce), fatter and larger than its predecessor. Last year's Galaxy S4 never lived up to its incredible hype, and sales were a disappointment. It's still the best-selling Android smartphone, but Samsung's reputation has taken a big hit after essentially tweaking the previous year's Galaxy S3 and calling it the next best thing. Samsung also drew criticism for adding numerous quirky but largely useless features to the Galaxy S4, including eye scrolling, finger hovering to preview items and video pausing when you take your eyes off the screen. "With the Galaxy S5, Samsung is going back to basics to focus on delivering the capabilities that matter most to our consumers," said JK Shin, head of Samsung's mobile divison. "Consumers are looking for mobile tools that inspire and support them as they improve their everyday lives." As part of that "back to basics" approach, Samsung's new additions to the Galaxy S5 were mostly practical features. Mimicking a feature that debuted on the Apple (AAPL) iPhone 5S, Samsung's Galaxy S5 home button doubles as a fingerprint sensor. Unlike the iPhone, which allows its owner to simply touch the home button to unlock the screen, a Galaxy S5's owner has to swipe down on the reader. But it can be used for other applications as well, including authenticating payments made with eBay's (EBAY) PayPal. The pulse monitor sits at the back of the phone, next to the flash. Rest your finger on it, and the screen displays your heart rate. It also works in conjunction with Samsung's new Galaxy Gear 2 smartwatch and its corresponding fitness apps. The battery got a nice improvement, but Samsung added some power-saving features as well. When the battery is about to die, Samsung will turn screen to black and white and shut down all unnecessary features, including most wireless communications. Samsung says the Galaxy S5 is completely protected against dust, and can resist water up to 1 meter for up to 30 minutes. Those kind of features had previously been reserved for special, ruggedized phones, including Caterpillar's (CAT) B15 smartphone and Samsung's Galaxy S4 "Active." Perhaps the most useful feature is the Galaxy S5's display, which automatically adjusts its settings when indoors and outdoors -- not just the screen's brightness, as most phones do. The Galaxy S5 will change the color saturation and contrast too, so that it provides a legible picture when in direct sunlight.